More and more people like watching and sharing their picture collections in slideshows. A dynamic slideshow can bring all your best memories back in front of your eyes. 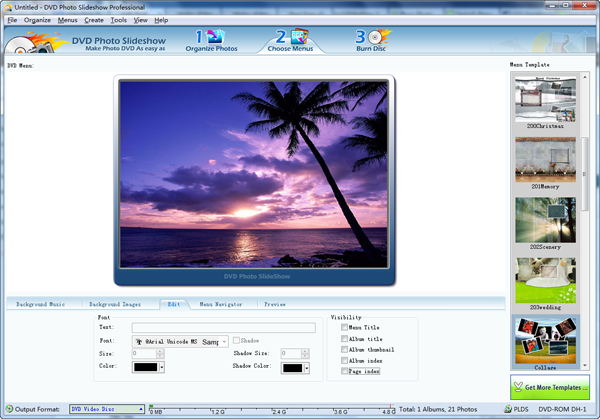 With DVD Photo Slideshow – a powerful slideshow software for Windows 8, you can easily make slideshow DVDs or slideshow videos from your photos. Comparing with still photos, slideshows can attract people attention and interest. DVD Photo Slideshow enables you to produce slideshows for Facebook / YouTube and mobile devices, such as iPad, iPhone, Android smartphone. Also it can burn a slideshow onto DVD for watching on TV or DVD player. 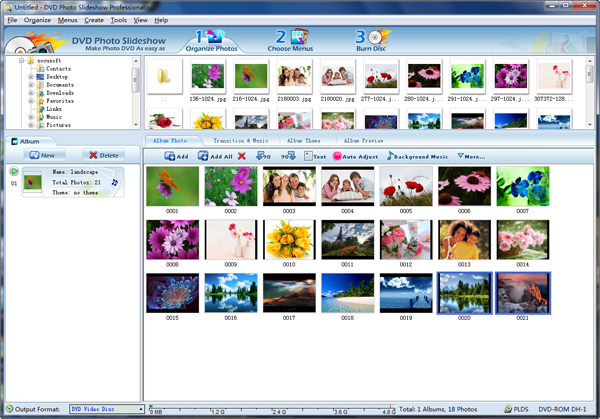 Click Organize Photos tab, drag photos to Album Photo Area from your windows 8 PC to start making a slideshow. Or you can use the Add and All All button to import photos. You can easily drag and drop to arrange photo order. Under sub-tab Transition & Music, you can choose transitions for slides from kinds of built-in transitions effects, add one or more song as background music. If you do not want to choose transitions, the program can apply random transitions for all slides. Click Album theme, there are various eye-catching themes for choosing, like Christmas theme, Birthday theme, Wedding theme and more. If you do not want to burn your slideshow to DVD, you can skip this step. For this step is used to choose and customize DVD menus. You can choose a menu , then choose it with background music and image for a chosen DVD menu, edit title for the menu, and etc. Switch to Burn Disc tab, click Output Format drop-down list and choose a video format, such as mp4, mpg, avi. You can choose to save the slideshow for iPad / iPhone / iPod / Archos / PSP, or for YouTube / Facebook / MySpace. Also you can choose to burn the slideshow onto DVD and CD. This entry was posted in DVD Photo Slideshow and tagged create slideshow dvd on windows 8, slide show video maker for windows 8, windows 8 slideshow software on March 19, 2013 by Sarah Jablich.